NASHVILLE, Tenn.-- Having just spent two weeks doing interviews and promotion for his Cosmic Hallelujah, Kenny Chesney came into Nashville grateful – and humbled by the response to his chart-topping duet with P!NK “Setting The World on Fire.” Having spent several days getting ready to receive the Country Music Association’s Pinnacle Award at the 50th Annual CMA Awards – given for only the third time in the organization’s history – he took the idea of his speech very seriously, even mentioning “responsibility” in what he said onstage. NASHVILLE, TN – (Nov. 03, 2016) – Illinois native and Atlantic Records/Warner Music Nashville artist Brett Eldredge will celebrate with the World Champion Chicago Cubs on Friday. Eldredge will join the team in the parade from Wrigley Field to Grant Park, where he will perform “Go Cubs Go” with members of the team. 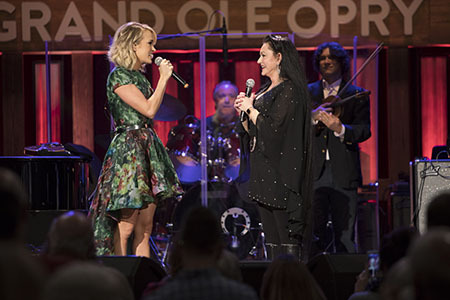 NASHVILLE – It was a celebration five decades in the making when winners were announced tonight during “The 50th Annual CMA Awards” live from Nashville. Brad Paisley And Kimberly Williams-Paisley Premiering Twenty-Eight Million Dollars Of Johnathon Arndt Jewels At The "50th Annual CMA Awards"
NASHVILLE, Tenn., Nov. 1, 2016 /PRNewswire/ -- When the stars of Country Music's biggest night hit the Red Carpet for the "50th Annual CMA Awards," Brad Paisley and his beautiful wife Kimberly Williams-Paisley will be sharing something very special this year, the "Heart of the South Diamond" designed by celebrity Jeweler Johnathon Arndt. "The 50th Annual CMA Awards" will be hosted by Brad Paisley and Carrie Underwood and broadcast live from the Bridgestone Arena in Nashville, Wednesday, Nov. 2 (8:00-11:00 PM/ET) on the ABC Television Network. NASHVILLE, Tenn. – (November 1, 2016) –-Platinum-selling recording artist Cole Swindell just wrapped the first weekend of his headlining CMT ON TOUR Presents the COLE SWINDELL DOWN HOME TOUR with sold-out shows. The tour kicked off last week with fans packing a sold-out Cain’s Ballroom in Tulsa, OK and continued to Wichita, KS, Denver, CO, and Odessa, TX. Swindell takes a brief detour back to Nashville this week for the 50th Annual CMA Awards where he is nominated for CMA New Artist of the Year. The Down Home Tour will continue Friday (Nov 4) at the Lyric Oxford in Oxford, MS.
NASHVILLE, Tenn.– George Strait recently announced the Nov. 18 release of Strait Out of the Box: Part 2 exclusively with Walmart. This impressive three-disc, 56-track collection features 36 hit singles including 26 No. 1s plus two brand new songs co-written by Strait along with 18 choice album cuts, all personally selected by the King of Country Music. Strait Out of the Box: Part 2 spans 20 years of Strait’s career from 1996 to 2016 and follows the highly successful, 8x Platinum-selling 1995 release, Strait Out of the Box. 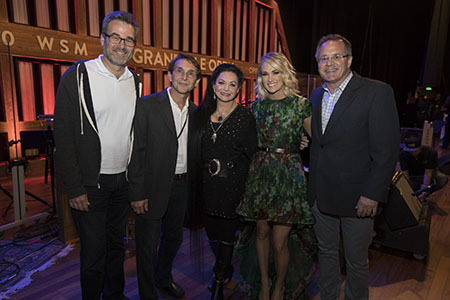 NASHVILLE, TN (NOV. 1, 2016) –From the stage of Nashville’s iconic Ryman Auditorium, Little Big Town, along with Nashville Mayor Megan Barry and Ryman Auditorium General Manager Sally Williams, announced this morning their upcoming "Little Big Town at the Mother Church" residency. The first ever Ryman residency, slated for six nights in 2017, will kick-off on February 24 during Country Radio Seminar week. The date will coincide with the release of the Grammy-winning band’s seventh studio album entitled, The Breaker. Additional dates scheduled for the residency are February 25, May 19 & 20 and September 15 & 16. The opener for the February 24 show will be Brent Cobb and February 25 will be Ashley Monroe. Tickets and special two-day packages for all shows will go on sale Friday, November 4 at 10:00 a.m.via ticketmaster.com and ryman.com and will be available online only. Tickets for the concerts will be $90.50, $60.50 and $50.50. Each ticket purchased to see Little Big Town at the Ryman includes one (1) physical album of Little Big Town’s new album, The Breaker, scheduled to be released on February 24, 2017. Also on Friday, CID Entertainment will offer additional VIP experiences. For full details, visit bit.ly/2e5PIws.